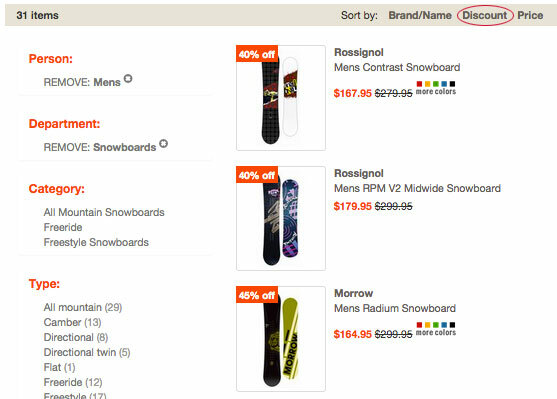 While personalization engines can track search and navigation behavior to determine how to select the most relevant content to a site visitor, a lesser-known tactic is to use how category and search results are filtered to provide more contextually relevant product list results. 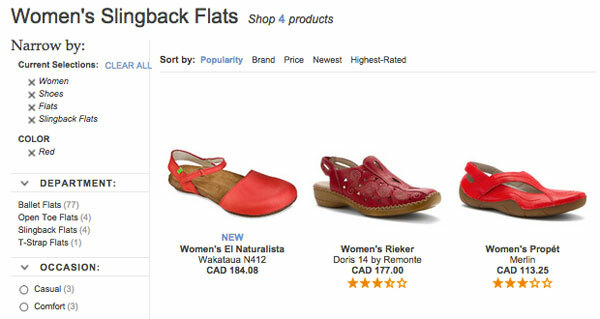 Product lists typically include image, product name, price, and if you’re lucky, star rating. Too often the product attributes that matter to the customer’s decision are hidden behind these links, resulting in guessing and pogo-sticking behavior (viewing products, returning to results, over and over and over). Remember, this kind of hassle is even more frustrating for customers on mobile devices. Filter options are sometimes absolute (e.g. color, size or brand), but often are a range (e.g. price or TV screen size). When a filter uses a range, it’s great usability to pull the attribute detail into results. This is a dilemma I encounter when shoe shopping. Some women with ankle contractures, like myself, require an exact heel height. In my case this is 2.5 inches. I appreciate sites that allow me to filter by height to at least narrow the thousands of results down to hundreds, but I still have to pogo-stick forever to find styles that are exactly 2.5 inches. 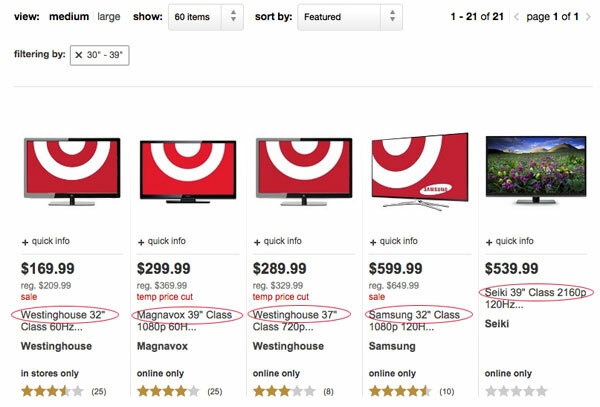 When filtering results by screen size, the customer can see at a glance the difference between items. This is especially useful since the product images look very similar. Another common filter is % off, typically a range of “20% and more, 30% and more, 40% and more” et cetera. Amazon, for example, allows you to filter by discount tier but doesn’t call-out the discount. 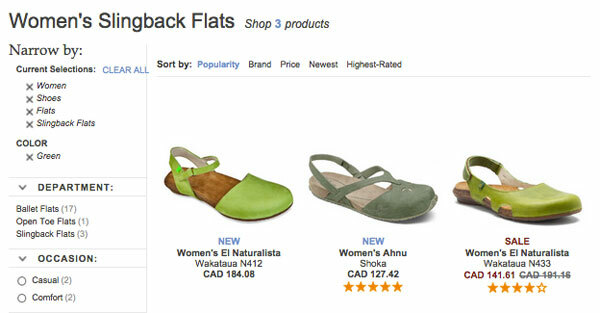 Altrec trumps Amazon, not only showing the % off badge right on image thumbnails, but also supporting sort-by discount. In order to provide the user with direct insight into product aspects they’ve expressed an interest in, sites must dynamically include product specifications (i.e., the “product aspects”) based on the user’s applied filters and sorting (i.e., the “user’s interests”). Luckily this isn’t as tricky as it might seem at first, since the data is already structured (necessary for it to be filtered or sorted by in the first place). Selectively including it in the individual product list items is then simply a matter of detecting which filters have been enabled and including those respective values in the list items. Other filters that benefit from image swapping are flavor, size, bundle/value pack or anything attribute that requires its own image on a product page. 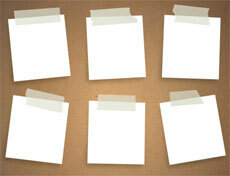 Brand and product-compatible accessories should be easily filterable and called-out in product lists. Baymard’s testers frequently had trouble finding compatible accessories from list pages, often forced to read product descriptions to verify compatibility or use product finder wizards. 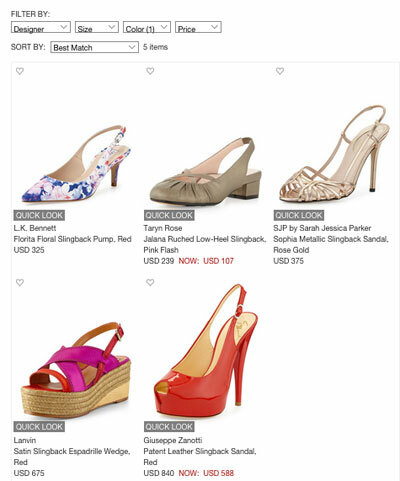 While wizards are a great way to help customers find compatible accessories, you can go the extra mile to infer the compatibility choices based on search box queries and items in the cart when the customer navigates to accessory category pages. If compatible filters exist, ensure the results “call out” the compatibility in the description snippet visible on the list page. Perhaps the most straight-forward way to adapt list items with compatibility notices is to base them on the user’s cart contents. So if the user has, say, a 13-inch laptop in the cart, the list item of any computer bags and sleeves compatible with that laptop can be altered to include a small message stating their compatibility. 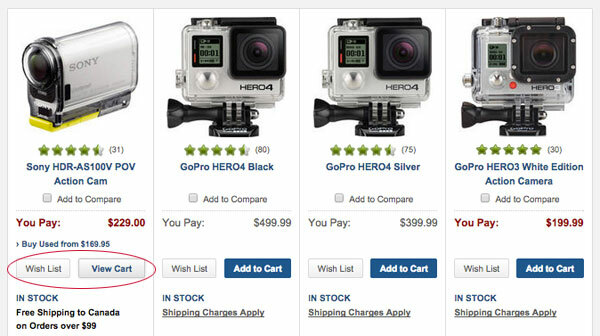 If the user has multiple items in the cart, multiple notices could potentially be displayed. It’s noted that automatically including this context is a supplementary way of using your product compatibility database, but can fail due to false or irrelevant detection, and shouldn’t be used as a replacement for compatibility filters and product finders. Baymard proposes showing sub-categories in listing results can further aid customers’ refinement. Only one site Baymard tested adhered to this, Newegg. 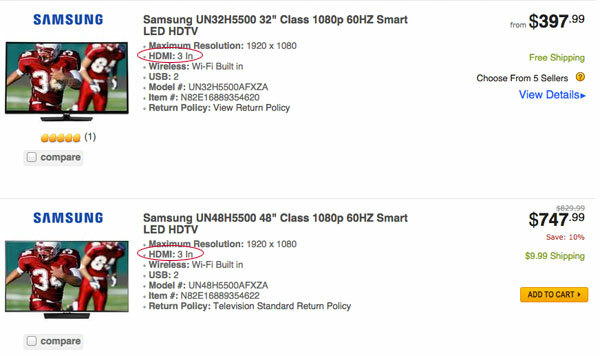 For example, if a user filters by number of HDMI 3 In, it’s visible in results. 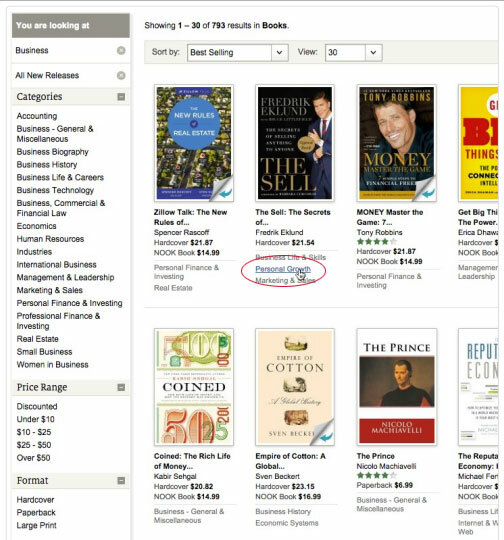 Baymard also mocks up what Barnes and Noble could look like if it included sub-category links with product thumbnails. Not only does this provide scannable context, but also an additional way to filter results. 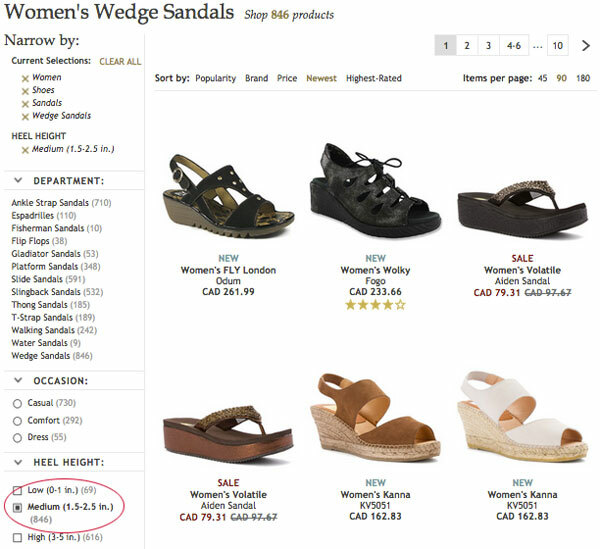 The report suggests allowing the user to adjust quantity of in-cart products from the list, or including links to related products. 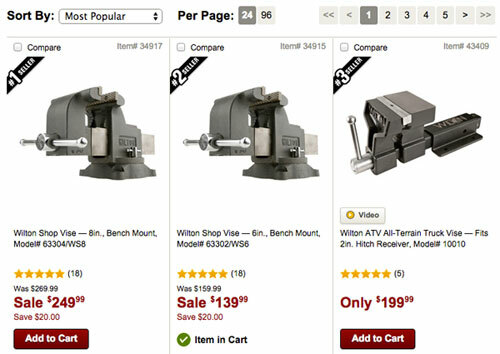 2 sites that use this are Northern Tool and B&H Photo. These are just 5 of the 93 guidelines for product lists and filtering in Baymard Institute’s original research…check it out!